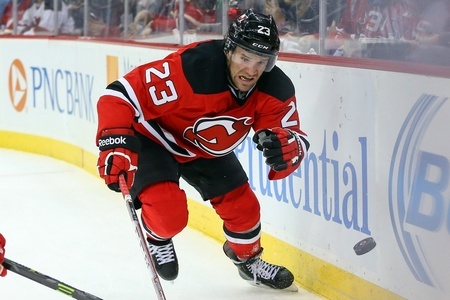 The National Hockey League has suspended New Jersey Devils forward Bobby Farnham for a grand total of four games after his “violent, predatory” hit on St. Louis Blues forward Dmitrij Jaskin. Jaskin wasn’t injured on the play and Farnham was issued a major penalty for interference and was shelved with a misconduct. The incident took place at 11:50 of the third period, with the Devils down by two goals. The Blues eventually went on to win the game by a final score of 5-2. The hit came after Farnham was plugged by Blues defenceman Kevin Shattenkirk and went looking for anyone in a St. Louis jersey to mug. He got his chance and charged Jaskin a full second after he released the biscuit, starting his momentum and following through with a pretty big hit. Farnham’s role on the Devils has been as an energy guy and that’s all well and good, but he crossed the line with this play. After recording four fighting majors in his first five NHL games with the Pittsburgh Penguins, he was sent down to the AHL and managed a few call-ups when the club decided they were going against tough opponents. After three games in Pittsburgh to kick off the 2015-2016 season, the Penguins put him on waivers and the Devils snapped him up. In 27 games with New Jersey this season, Farnham seems to have found a bit of a scoring touch. He has seven goals and a total of eight points in limited ice time, which puts him among the team’s top scorers. Weirdly, Farnham has never scored more than eight goals in a single season during his NCAA days at Brown. But it’s still the rough stuff that gets the dude noticed. This is a pretty harsh suspension given the league’s M.O. in general, especially given Farnham’s lack of suspension history and the fact that the hit wasn’t to the head. On the other hand, the Devils forward exhibited such a blatant disregard for the rules of hockey that you have to imagine the hammer coming down in some capacity.